An Afghan policeman reacts as smoke billows during an attack near the Pakistani consulate in Jalalabad, Afghanistan, Jan. 13, 2016. Officials in eastern Afghanistan said a gun and bomb attack Wednesday near the Pakistani consulate in Jalalabad killed seven security personnel and wounded 10 people, including three civilians. Islamic State militants claimed responsibility for the assault. Afghan police and witnesses said the attack began with several massive explosions near the consulate, which is located near India's consulate, a hospital and several schools. The provincial police chief, General Fazal Mohammad Sherzad told reporters that three attackers were targeting the Pakistani consulate and planned to enter the facility from an adjacent guest house. But he said security forces surrounded the house and killed them in a two-hour gunfight. 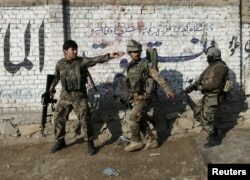 Afghan National Army (ANA) soldiers arrive after a blast near the Pakistani consulate in Jalalabad, Afghanistan, Jan. 13, 2016. Pakistan's Foreign Ministry condemned the attack and said only one consulate official was slightly injured by broken glass. A ministry statement said Pakistan has asked the Afghan government to "thoroughly investigate this incident" and to ensure the safety of Pakistani diplomatic missions and officials in Afghanistan. The office of Pakistani Prime Minister Nawaz Sharif said it received a phone call from Afghan President Ashraf Ghani, who expressed grief and concern over the attack. A statement said Sharif told Ghani that terrorism is a common enemy for both the countries and "we will fight this menace together to eliminate it once for all." Wednesday's attack comes as delegates from Afghanistan, Pakistan, China and the United States, meeting in Islamabad, renewed efforts aimed at ending the 15-year war between the U.S.-backed Afghan government and the country's former Taliban rulers. 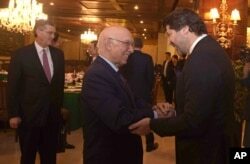 Afghanistan’s deputy foreign minister, Hekmat Khalil Karzai, right, and Pakistani foreign affairs adviser Sartaj Aziz exchange greetings before a four-nation meeting to develop a peace process for Afghanistan. Talks with the Taliban have been on hold since July, when they collapsed after just one meeting following Afghanistan's announcement that longtime Taliban leader Mullah Mohammad Omar had been dead for more than two years. The Taliban called off its participation and a second meeting was canceled. Speaking in Islamabad shortly after the consulate attack, Afghan ambassador to Pakistan, Janan Mosazai, warned that Islamic State poses a potentially devastating threat to both countries. “We believe that this [Daesh or IS] is a serious threat and if left unchecked, if left unaddressed it can exacerbate in a significant way the security challenges that this region especially Afghanistan and Pakistan are already facing,” Mosazai said. The Afghan ambassador emphasized the need for seeking an urgent solution to the war in Afghanistan with the help of “sincere and concrete” Pakistan support. “So that the Afghan forces and their counterparts on the Pakistan side can dedicate the resources and the capabilities required to nip this Daesh menace in the bud and to make sure that the ideology of Daesh and the tactics of Daesh do not seep into the minds of impressionable youth in this region,” he said. Afghan officials allege the Taliban leadership is sheltering in Pakistan and Islamabad's military is better placed to influence insurgent leaders and push them to the table for peace talks with the Kabul government. Pakistani officials insist their influence with the insurgent group is overstated particularly after the emergence of internal rifts since July when the death of Mullah Omar was announced. VOA's Chris Hannas contributed to this report from Washington.